Happy Thursday my stamping peeps! The color challenge over at Create with Connie and Mary this week inspired me to bring a softer side to the holiday season. I love the Candy Cane Christmas stamp set and thought it would be fun to highlight a couple of the stamps in it. The tree and mitten are classic winter stamps and stamped in rows make for a fun background. I stamped and cut out two additional mittens then attached a piece of Whisper White Baker's Twine to them to simulate an old fashioned pair of mittens that most of us grew up with. In the center of each mitten is a small pearl to give them even a little more character. The greeting is from the Wondrous Wreath set. 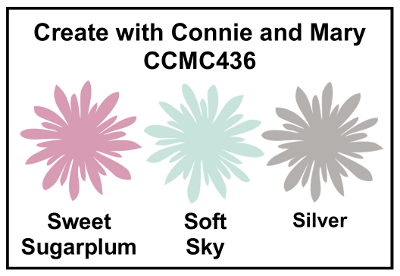 Our fabulous Silver Glimmer Paper adds just the right touch of pizazz to the softer Sweet Sugarplum and Soft Sky colors. Happy Stamping! Oh...LOVE the background you created with those small images! I find them hard to work with, but this is a GREAT idea I'll need to remember! My grand kids have the mittens with strings! lol! Great job with the color challenge this week! Great handmade DSP! Very cute! I love that you turned these images that are meant to be cookies into winter trees and mittens! They work perfectly with these colors! Well done, Jennifer! Super cute card! Love the idea of creating the cute background. I need to remember to do that too!